So let me make a shrewd guess at what Emmanuel Macron wants us to understand with his particular take on ‘making the planet great again.’ And I would add, all other signatories to the climate change accord, along with him. They are all supposedly dedicated and committed supporters of the supposition that an excess of CO2 (primarily) is warming the Earth to a dangerous degree, and must be prevented from doing so further via actions which greatly reduce carbon emissions in everyday life. Right? OK, so all you wise and earth-caring politicians, if you really believe in your own rhetoric, will you answer a few questions from a curious observer? These same questions also apply to many others who share Mr Macron’s views. Firstly, why are you so openly promoting the invasions of foreign countries, arms sales and general rhetoric of ‘war against terrorism’ when it is a well established fact that the military, including air force and navy, are amongst the single greatest contributors to climate destabilization? Are you aware that the military (US,* NATO, national forces) are amongst the highest, if not highest, users of fossil fuels on the planet; releasing vast volumes of toxic materials directly into the earth’s atmosphere and doing immense physical damage to the planet’s fabric at the same time? Secondly, why do you promote, or at least fail to limit, the widespread use of monocultural agrichemical farming practices which greatly inhibit the soil’s capacity to absorb CO2 emissions? Thirdly, why do you continue to allow the expansion of commercial airlines, the building of new runways and the concreting over of green spaces, when you know that high flying jet aircraft disrupt the ozone layer and deposit toxic carbons over vast regions of the upper atmosphere – and indeed on Earth as well? Fourthly. How come you support, and fail to control, freight carrying cargo ships that ply their trade from one end of the planet to the other, yet have been identified as emitting high levels of CO2, contributing further to overall volumes in the atmosphere? Fifthly, Why are you so proud of making your new domicile in a power hungry palace and generally showing your admiration for all facets of industry that deliver ‘growth’ by extracting the maximum amount of energy from the earth, at the cost of potential ecocide? Is this your way of “making the world great again” ? In fact, why, if you believe in what you say, do you support the current global economic agenda at all, now that you know that ‘maximum growth neoliberal globalism’ is the chief cause of the very problem you swear is bringing the planet to its knees? Please can you answer these questions Mr Macron? Please can you answer these questions leaders of the European Union and other countries that signed the Paris climate accord? Please can you deliberate over these observations climatologists, environmentalists, greens and all others who say ‘the science must be right’ without ever bothering to examine the question themselves, or indeed change their life styles? “Oh, but the economy is far too important to allow anything to get in the way that might be contrary to its continuous growth and expansion. Arms sales are our biggest earner. Invasions of foreign countries are, err, necessary to defeat terrorism. Agrichemicals and GMO are essential to feed the world. Airlines promote global tourism, easy business and exports. 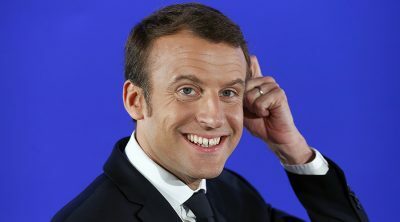 May I interrupt for a moment Mr Macron? What if the price of these ‘affordable goods’ is inhuman, sweat-shop slave labor in Southern hemisphere countries, leading on to the mass production of both commodities and foods that are then packaged, shipped and flown all around the world, contributing hugely to global CO2 emissions? Maybe you didn’t know that a typical range of foods you see being dumped into a supermarket trolley has traveled more that 7,000 kilometres. Is that mitigating climate change? Is that supporting short supply chains and ecologically benign energy footprints? And what about your military exploits in other countries? In light of the fact that you now know that the CO2 spewing war-machine, a product of the military industrial complex that you are so proud of, is entirely antithetical to your insistence that ‘in order ‘to make the world great again there must be a united effort to reduce CO2 emissions’ – are you willing to radically revise your foreign policy position? Lastly, Mr President and all other masters of hypocrisy, are you happy with dumping barely disguised ‘carbon taxes’ on ordinary people striving to earn a basic living, while you and your business and banking elite plunder the national coffers – and the planetary ones – so as to acquire ever higher salaries, pay-offs and luxury perks for yourselves and your families? So in fact, Emmanuel Macron and similar proteges, you either don’t believe one iota in CO2 provoked climate change in the first place, or you couldn’t give a damn’ about it, even if you might agree with it. Right? It should be plain by now, to all uncritical believers in the ‘climate accord’ that it is a giant hoax. That none of those ‘important people’ who stand up on a world stage and state that ‘counteracting climate change is the single mot important concern of the decade’ demonstrate any personal interest in their public protestations. They are fakes. And all those who are genuinely concerned about this issue, should return to square one, do their own research and seek to find their own answers. Don’t be led by the nose. Julian Rose is an early pioneer of UK organic farming, an international activist, writer and broadcaster. His articles appear in a wide diversity of journals and on-line sites. He is President of the International Coalition to Protect the Polish Countryside and spends much of each year in Poland. Julian is the author of two acclaimed titles: Changing Course for Life and In Defence of Life. Read more on www.julianrose.info.